Netanyahu meets Norwegian Foreign Minister Espen Barth Eide, discusses Iran’s nuclear program as well as the latest rocket attacks. Prime Minister Binyamin Netanyahu met Wednesday with Norwegian Foreign Minister Espen Barth Eide. The two discussed Iran’s nuclear program as well as the latest escalation in rocket attacks from Gaza. Netanyahu said during the meeting, "This model of a country talking, but at the same time developing nuclear weapons; threatening and at the same time developing nuclear weapons and threatening the use of nuclear weapons, we cannot allow this to happen in Iran. “There are many issues in the Middle East, the issues between us and the Palestinians and our quest for peace, there are regional issues but I think they will be overshadowed if Iran believes it has a license to develop atomic weapons and I it pursues the development of these weapons. We have to make sure this doesn't happen," he added. 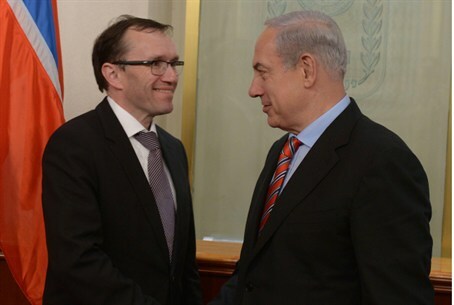 Foreign Minister Eide said, "We are on the board of IAEA and I was quite recently seeing Secretary General Amano. We are really concerned about the lack of cooperation and the fact that we're allowed to go to the irrelevant sites but not to the sites we want to see. This is something that we're raising the volume on." Commenting on the latest rocket attacks by Gaza-based terrorists on southern Israel, Netanyahu said, “If the quiet is violated, we will respond strongly. The security of Israel's citizens is my chief concern and we will know how to defend the security of our people." On Wednesday morning, Gaza terrorists attacked for a second time in 24 hours, firing two rockets at the city of Sderot in southern Israel. The Color Red rocket alert siren warned of the incoming attack. Both rockets hit open areas and did not cause injury. On Tuesday terrorists in Gaza fired a mortar shell at Israel. The IDF responded with the first airstrikes in Gaza since Operation Pillar of Defense ended in November. On Wednesday night, Gaza-based terrorists yet again fired a rocket at southern Israel. Shortly before 2:00 a.m., the “Red Alert” siren was sounded at the Eshkol Regional Council. A rocket from Gaza exploded in an open space in the region shortly afterwards, causing no physical injuries or damages. Minister of Economics and Trade, Naftali Bennett, told Eide Wednesday that Israel will have to defend itself against terrorism from Gaza. "The thousands of missiles that fell on Israel from Gaza crushed the remainders of the Israeli public's trust in ceding land in return for peace," said Bennett. "Now we will have to defend ourselves through our own actions," he said. "Children in Israel deserve to go back to school after the holiday vacation without fearing that a rocket will fall on their classroom."